With dramatic changes in the way people use their homes, Yasmine Goodwin says it’s hard to refer to the kitchen by that term anymore. “It’s your meeting room, sharing room, the place where you prepare food and socialize with family and friends,” says Goodwin, principal designer of My Design Studio in Toronto, which works with developers and builders to manage decor sales and with renovators to finalize the scope of work and source products and finishes. That desire to have the kitchen as the multi-purpose hub of the home continues to drive renovation trends. While it must be functional, homeowners are demanding great style as well. 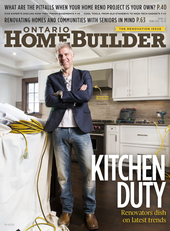 “More than ever, kitchens are a big deal and are the showpiece of the home,” says Eve Claxton, designer for Timberworx, a custom home building and renovation company in Guelph operated by her husband Shawn Marsh. Van Barneveld says every kitchen renovation his company carries out these days involves removing a wall or two. Brad Livock, sales manager and project manager for Slotegraaf Construction, a Cambridge-area builder and renovation company, agrees and says that in older homes, particularly, walls will inevitably have to be removed to accommodate what’s on clients’ kitchen wish lists. With spaces opening up, islands are getter larger and featuring a high degree of design as they become the focal point of the kitchen. 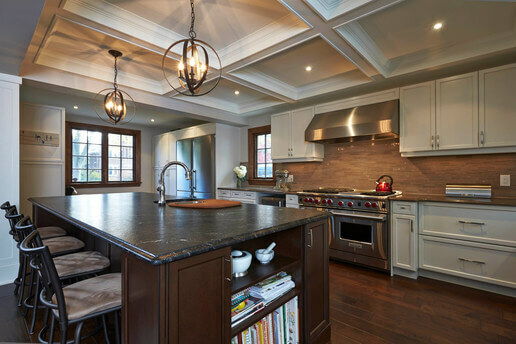 Currently popular are islands that feature colours other than that of the perimeter cabinetry, such as taupe wall cabinetry with a dark walnut-stained island. They may also feature different countertops, with furniture-like detailing such as corbels and legs, and may also incorporate a vegetable sink. Although his company still does a lot of double sinks, Livock says the trend is moving towards a single, large basin. Stainless steel is back and the integrated sinks of a few years back have begun to fade in popularity. Cabinets are extending the full height of the walls into the spaces that used to remain empty or filled by a bulkhead. They have become taller along with ceiling heights, which in newer homes tend to be nine feet or more. Cabinet styles are trending towards simple, Shaker-style panels made of maple or MDF (medium density fibreboard) in lighter wood tones or painted white, cream or linen. Livock also points out that quartz provides a consistency of colour that differing granite slabs cannot. The renovators agree that one floor material is the overwhelming favourite among homeowners, and that’s wood, whether it’s hardwood or engineered. Hand-hewn or reclaimed looks in wide planks are being used throughout main-floor spaces to seamlessly integrate the family room, kitchen and dining areas. Not only is wood warmer underfoot than tile; it also adds a softness to the hard surfaces of stone and metal in the kitchen. Stainless steel is still the top choice for appliances, which are being integrated into cabinetry. Livock says for almost every kitchen reno he executes, clients want the largest refrigerator they can get, and with prices more competitive, even homeowners on a budget can afford stainless steel or gas cooktops or ovens. Goodwin says steam ovens, which can cook multiple foods at once, are gaining momentum. Storage is also a priority with clients and a pantry is a must-have across the board, say the experts. Pantries incorporated in the kitchen, rather than walk-ins, are most desired. Recycling centres are a common request and manufacturers have developed slide-out systems that can be incorporated into cabinetry for recycling and separating garbage. Goodwin says with more people wanting to age in place in their homes, pull-down shelves that can be operated manually or electronically are useful in accessing taller cabinets. And drawers are replacing doors on lower cabinets for more efficient storage.